The special theme of the 2014 Stockholm event is "FTTH - Showcasing a Brighter Future", highlighting Nordic innovations in fibre access. Combining conference sessions with an exhibition and unparalleled networking opportunities, the FTTH Conference is the largest FTTH-focused event in the world, gathering more than 3,000 participants during its last edition held in London in 2013. 3M will highlight the LSZH version of its One Pass Mini Fibre Pathway. It is designed for use in brown-field Multi Dwelling Units (MDUs) or Single Family Units (SFUs) serviced by FTTH networks. Using the One Pass Mini Fibre Pathway significantly reduces final drop cable installation time and cuts down total customer installation time. The One Pass Mini Fibre Pathway is a flexible, surface-mount cable pathway and drop cable solution with one, two or four fibres which is installed in just ‘one pass’. It is used to connect from a distribution box to a point-of-entry location near an apartment door and then to a wall outlet in the living unit positioned near the ONT. The One Pass Mini Fibre Pathway virtually eliminates the time and expense of running new wiring through already decorated apartments as it uses 3M adhesive technology to fix the duct to the wall. Alcatel-Lucent is at the forefront of global communications, providing products and innovations in IP and cloud networking, as well as ultra-broadband fixed and wireless access to service providers and their customers, enterprises and institutions throughout the world. Underpinning Alcatel-Lucent in driving the industrial transformation from voice telephony to high-speed digital delivery of data, video and information is Bell Labs, one of the world’s foremost technology research institutes, responsible for countless breakthroughs that have shaped the networking and communications industry. Alcatel-Lucent innovations have resulted in the company being recognised by Thomson Reuters as a Top 100 Global Innovator, as well as being named by MIT Technology Review as amongst 2012’s Top 50 'World’s Most Innovative Companies'. With revenues of Euro 14.4 billion in 2012, Alcatel-Lucent is listed on the Paris and New York stock exchanges. The company is incorporated in France and headquartered in Paris. Anritsu is a supplier of fibre transmission test equipment. Best known for its OTDRs, optical spectrum analysers and signal quality analysers, Anritsu provides a complete range of products for research and development, production test, as well as for installation, commissioning, maintenance and monitoring of fibres. Anritsu will be displaying the latest fibre-optic testing solutions equipment including its MT9090A Network Master platform that offers all-in-one OTDR, selective power meter and optical loss test set, combining compact size with ease of use and high performance. It now includes new features such as Bluetooth/wi-fi/Ethernet connectivity, automatic pass/fail fibre testing with VIP, and macro bend automatic analysis. The Access Master MT9083A2 high-performance OTDR is designed to make measurements simple and error-free with true one-button fault location, pass/fail classification, automated file saving, and macrobend detection feature for identifying installation issues. Comsof will be highlighting its FiberPlanIT product. Planning FTTx networks used to be challenging. Both in the strategic phase – when estimating costs, comparing technologies and maximising the ROI – as during detailed planning – creating optimal to-build plans while integrating field survey data. FiberPlanIT answers these challenges, making planning FTTx networks smart, easy and fast. 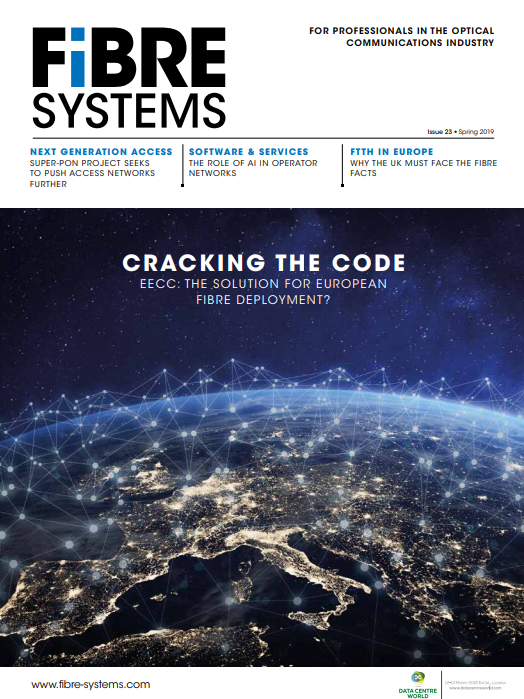 FiberPlanIT’s optimisation algorithms calculate the most cost efficient network - enabling savings in Outside Plant (OSP) design of seven per cent on average. Users are assisted throughout the whole planning process, from strategic planning down to detailed design, interfacing with the PNI tools, and the software allows users to design the OSP for 7,000 connections in fewer than three days. Corning is a leading manufacturer of fibre optic communication system solutions for voice, data and video network applications worldwide. It offers a broad range of end-to-end fibre optic and copper product solutions for customers' telecommunications networks. It will be introducing its newly-designed Centrix platform, an optical connectivity solution that combines termination density with an intuitive jumper routing system and cable management. Even with the increased density, the Centrix platform provides an efficient use of both jumper and cable routing space and meets the requirements of multiple application spaces allowing customers to use one platform across an optical network. Diamond will present two new products at the FTTH Council: the DiaLink, a smart push-pull in house cabling system and the OLiD Intelligent components, that allow the identification of each channel clearly and individually. DiaLink is a slender and unique connector system, which makes it easy to change a fibre connection from one place to another, e.g. to the opposite corner of a room or to another room, or even to a different floor. Naturally it can also be used to simply be pulled directly into installation ducts. Diamond OLID components are all based on FBG (Fibre Bragg Grating) technology and are suitable for fibre optic line testing before its activation or to be permanently integrated into an existing P2P network. These can be installed both on the central office or onto the OTO (Optical Termination Outlet), and allow a fast and clear optical line identification to avoid installation errors as well as for easy trouble shooting. Telecommunications companies are increasingly using visualisation and spatial analysis to plan and build the optimal fibre network. Esri’s ArcGIS is a spatial technology that helps companies analyse markets, plan networks for maximum ROI, accurately determine serviceability, proactively manage network assets, and increase operational efficiency. HellermannTyton is an established and innovative global leader in the provision of network infrastructure cabling solutions, offering a broad range of quality, high performance connectivity for both residential and commercial use. HellermannTyton‘s Broadband Systems comprise a range of fibre splicing closures for the external and internal plant that one would find in any typical FTTX application. The sealed closures from HellermannTyton protect the fibre management systems from adverse environmental conditions, while maintaining ready access for effective cable installation. The fibres are housed in space saving modular units that minimise network disruption and have been designed to allow further modules to be added at a later date for increased capacity, ensuring a future proof design. All of the closures from HellermannTyton offer flexibility and access so that more fibre can be added in the future (up to their maximum capacity). All of the closures are compatible with Cablelok, HellermannTyton‘s 100 per cent mechanical seal. core available for other immediate tasks. The management capability of the IGW3000 translates into significantly lower operational costs for the service provider due to fewer 'truck rolls'. Iskratel is a leading European communications vendor and solution provider with 65 years of experience, its own R&D and manufacturing, 900 employees and local presence in over 30 countries. Customers describe Iskratel as innovative and customer centric. Iskratel’s flexibility enables tailor-made solutions that blend into the customer's environment. Iskratel will showcase its latest solutions for broadband (SI3000 Lumia with FTTx and VDSL2 vectoring, rural broadband solutions, FTTdn and also GPON), backbone and communication core networks, including its own award-winning end user equipment. JDSU Network and Service Enablement provide end-to-end visibility and intelligence for consistent, high-quality network, service and application performance. Its range of FTTX test and measurement and portfolio of fibre access and FTTx tools helps turn technicians into experts as they can easily test and certify networks with minimal training or experience. Among the products on show will be: FiberChekMobile, an Android app enabling fibre connector inspection and analysis as well as optical power measurements on portable smartphone and tablets; FTTH-SLM, which helpssimplify OTDR testing and results interpretation; P5000i Digital Analysis Microscope, which facilitates the inspection and certification of fibre end-face quality to IEC standards in one button-push; SmartClass Fiber OLP-87, enabliing users to qualify, activate and troubleshoot B/E/G-PON and next-generation high-speed XG-PON and 10G-EPON networks; ONMSi, for optimising point-to-point or point-to-multipoint FTTH network availability and performance; and FTTA, a fibre optic test and measurement portfolio with end-to-end test capabilities for FTTA networks. The John Guest group has a long established reputation as a leading manufacturer of push-fit fittings, tube and other fluid control products. This reputation is built on producing consistently high quality products with an ongoing commitment to value engineering and product development. John Guest’s blown fibre fittings have been specially designed for the telecommunications market, for use in local loop, network and customer box applications. The extensive range of push-fit connectors cover both blown fibre and cable pressurisation systems and includes gas and water block fittings. The simple to use connectors help ensure that installations can be completed quickly and reliably. Keyfibre creates and develops fibre optic mechanical technology serving a wide range of markets worldwide. The company produces a guaranteed system comprising compatible, failsafe and consistent solutions with its KeyQuick mechanical integrated system. The design helps lower infrastructure, installation and operating cost. Keyfibre's other brands include KeyCleave, and Key-Tool-Kit, while new products in the KeyQuick range include the Mechanical PLC Splitter range, and the Mechanical Pigtail. Keymile specialises in advanced broadband systems that are used by network operators around the world. Its multi-service platform MileGate delivers a wide variety of ultra-high speed services. This enables network operators to realise all FTTx architectures with highest port-density and minimum life-cycle costs. MileGate ensures highest availability and flexibility, being a quality-driven product which is developed and produced in Germany and Switzerland. MileGate is a compact Optical MSAN (Multi-Service Access Node). Using optical fibre, up to 480 subscribers per 19-inch subrack can be connected with active Ethernet or several thousand subscribers via passive optical networks (GPON). Using the optional cable TV overlay, each customer can receive a traditional cable TV signal via the same optical fibre. With its VDSL2 vectoring solution, MileGate is also the perfect solution for the in-house cabling via copper lines in large buildings. So network operators can offer highest data rates on copper lines, too. Pacific Broadband Networks (PBN) is an experienced global technology company well known for offering advanced optical broadband products and triple-play connectivity solutions. PBN produces high-quality transmission products suitable for both cable operators and telcos offering cable, voice, and data services which provide asolution for advanced HFC, RFoG, and FTTx applications. PBN products have evolved through many years of excellence in R&D. More than 35 million subscribers are served using PBN products deployed in hundreds of headend facilities globally. PBN’s products and services have also been recognised by various historical events including 2010 Gauangzhou Asian Games, 2008 Beijing Olympics, and 2004 Sydney Olympics. PBN’s offices are located in China, Europe, Australia and the Americas. Local presence by a large number of channel partners extends PBN‟s regional business and service support. Pengg Cable will present its newly-developed FTTH overall concept, which covers the complete passive infrastructure from optical distribution system, through the various cables, to the wall outlets in the apartments. Perfectly matched products ensure the optimal functionality of those FTTH systems. In this way, the company has developed from being a pure manufacturer of cables and components to a one-stop-shop for passive FTTH systems. The newest member to Senko’s product line is the Smart Cleaner, a dry cloth cleaner specifically designed to clean single fibre connections residing in an adapter, faceplate or bulkhead. Made out of anti-static material the Smart Cleaner is ideal for working in sensitive environments and can be used for 750+ cleanings. Senko’s Smart Cleaner is composed of a replaceable cartridge containing the cleaning string and the retaining handle, which holds it. The handle unit and the cartridge are sold as one unit, while replacement cartridges may also be purchased separately. Skylane Optics is a leading provider of transceivers for optical communication. It offers an extensive portfolio for the enterprise, access, and metropolitan fibre optical market as well as for smart home and home networks based on plastic optical fibre. Skylane Optics is headquartered in Fraire, Belgium where also the logistics centre and the high tech laboratory are located. It covers the European market with a strong partner network and has offices in Brazil, Taiwan, Sweden and Italy to support partners and customers locally. The offerings provided by Skylane Optics are characterized by high quality and high performance. In combination with its strong technical support, the enable our customers to build cost optimized network solutions solving existing and future capacity needs. For FTTH, Skylane Optics shares its expertise with KDPof, for 1Gbps technology over Si-POF, and DigitalStrom, for their smart in home network and control technology, to offer a Complete Smarthome Solutions. UTEL is one of Europe's leading independent research and development companies in the field of telecommunication test and measurement and has developed many remote fault detection technologies. For example, Fast Light is a PON management and monitoring system, which provides the full tool set for ensuring network build quality during rollout, and advanced test and diagnostic tools for automatic fault identification and localisation. Fast Light is cost-effective and can be used on any PON system without the need for any other equipment. UTEL also designs and supplies a range of high quality infrastructure products including racks and shelving units, and fibre termination distribution units.